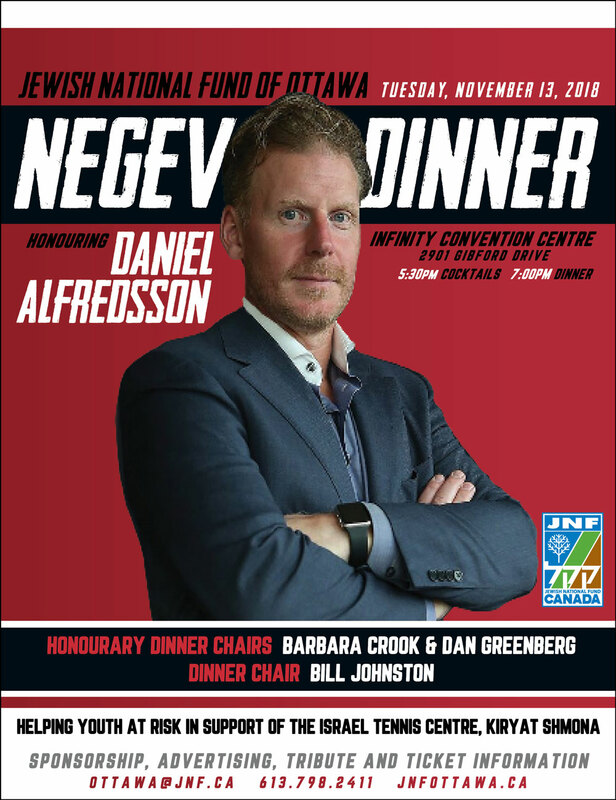 JNF Ottawa is proud to honour Daniel Alfredsson at the 2018 Negev Dinner. The Ottawa Senators’ team captain for 13 seasons (1999-00 to 2012-13), Daniel Alfredsson was the first Senator to capture a major national Hockey League award, winning the Calder Trophy in 1995-96, the King Clancy award in 2012 and later the Mark Messier leadership award in 2012-13. In 2014, Alfredsson returned to Ottawa to formally retire from professional hockey as a Senator. In September of 2015 Alfredsson joined the Senators’ front office as senior advisor of hockey operations, a position he maintains today. Daniel Alfredsson was inducted into the International Hockey Hall of Fame in 2018. Alfredsson has been an active member of the Ottawa community, most notably as the public face of the Royal Ottawa’s “You Know Who I Am” campaign to raise awareness about how many people are affected by mental illness. Please join JNF Ottawa as we honour a true local hero! JNF Ottawa is proud to support ITC Kiryat Shmona for the 2018 Negev Dinner honouring Daniel Alfredsson. JNF Ottawa Negev Dinner 2018 proceeds will help to fund the Social Services infrastructure of the Israel Tennis Centre in Kiryat Shmona, thereby making it easier for a growing number of youth-at-risk to access essential programs and social services and wellness activities. Since 1976, ITC has become one of the largest social services organizations in Israel and has provided thousands of youth at risk with critical life skills that will enable them to succeed as adults. Municipalities now recognize the Youth at Risk Program for stabilizing communities, reducing crime rates and improving childrens’ academic performance and behaviour. As such, there is a huge demand for ITC to expand existing at-risk programs across most of its 14 centres. From Israel’s northern Kiryat Shmona to Be’er Sheva in the south, the ITCs offer a variety of essential services and programs, including specially designed programs for Youth at Risk, special programs for children of immigrant parents, homework tutoring, English Language Fluency and a Special Olympics program for special needs children, including the hearing impaired. A Sport Psychology Program helps children with communication, focus and concentration, problem solving and issues related to stress, pressure and anger. Tennis programs are offered for children and adults, from beginners to advanced players. Students at risk are referred to the ITC from local schools, municipalities, the National Program for Children and Youth at Risk and other NGOs such as the Israel Anti-Drug Authority. Their behavior issues are often a clear indication of the need they have for a safe, structured and nurturing place to go after school. The ITC introduces them to comprehensive and holistic programs that combine sport, socialization and role-modeling within a pressure-free and nurturing environment where they can feel appreciated, loved and encouraged to develop positively. They receive help with homework and counseling on broader social issues involving family and friends. These programs help children at-risk attain normative patterns of behavior, while equipping them with tools that will help them deal successfully with pressures at home and in school. At the age of 14, Andy was ranked number 1 in Israel for his age group. Following the completion of his military obligation at the age of 21, Andy returned to the ITC – Ramat Hasharon to continue his training. “Without the ITC during this time, it would have been impossible for me to accomplish my dream.” He reached the doubles semi-finals at Wimbledon in 2003, won three grand slams in Australia, mixed doubles at the French Open and Wimbledon. Another great moment for him was representing Israel in 2014 at the Davis Cup in Florida against Argentina. Today Andy is not only giving back to the ITC, he is also expanding his influence outside the ITC. He was recently named CEO of Pulse Play, a revolutionary new wearable device. 11 Nadolny Sachs Private, Suite 205.